Though lawmakers in favor the bill argued that the new wardrobe requirements were for bicyclists’ own safety, research on driver behavior doesn’t necessarily back this up. 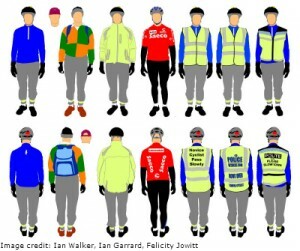 In fact, new research is showing that “high-vis” clothing is not as effective at increasing bicycle safety as is often assumed. wobble riders in each outfit appeared. Overall, the researchers found that variations in the outfits had virtually no effect on how close motorists got as they passed the cyclist. But there was a key exception: Drivers kept a significantly wider—and thus safer—distance from the bicyclist when he was wearing the “police” vest. This finding is useful because it confirms that the methodology was sensitive enough to detect different responses to the outfits. Although the study gathered data based on genuine driver behavior on real roads, it’s important to note that there were also variables that they could not standardize. Recent studies from New Zealand, and Canada have also concluded that the effectiveness of high-visibility gear may be overstated. However, you may not want to toss out your reflective safety vest quite yet. A 2009 review analysis of 42 studies by the Cochrane Collaboration concluded that fluorescent materials can improve safety for cyclists and pedestrians. Although these visibility measures may help drivers notice pedestrians and cyclists, more research is needed to determine whether increased visibility actually translates to fewer crashes, injuries, and deaths. The purpose of high-visibility gear is to help inattentive drivers or drivers with poor vision to recognize and avoid the rider, especially in low visibility conditions such as rain or darkness. If the driver would have seen the cyclist regardless, there’s no reason to think that the gear would somehow magically make the driver into a more considerate person. Does anyone believe that high-visibility gear is intended to stop aggressive drivers from being aggressive? It makes sense that impersonating a police officer would change a person’s driving behaviour, as would recording license plates and passing distances to cite drivers who get illegally close, but that’s not the problem that hi-vis is intended to solve. Downplaying the value of high visibility gear by measuring its efficacy for an unintended purpose is foolish and irresponsible of the authors. Could not agree more with concerned. I’ve seen stats that say a lot of accidents are down to not seeing the person. This was just recording how close they pass once they have seen the person. A different matter. So we can dress as brightly/safely as we want, but still risk our lives due to the ignorance of some drivers. Not great! 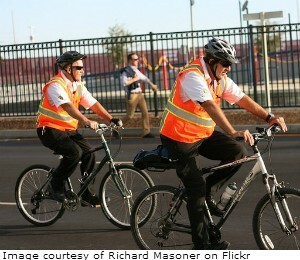 The comment by CONCERNED mistakes the purpose og high visibility gear. The purpose of wearing such is to improve the safety of the wearer. The >assumption< is that safety is compromised by some difficulty in seeing the (cyclist in this case) when not wearing the gear. That increasing the visibility of the 'cyclist DID NOT decrease the incidence of dangerously close passes demonstrates that the assumption is likely untrue. As for "nattentive drivers or drivers with poor vision" they should be taken off the road by enforcing existing legislation, making the roads much safer for all users. All drivers of course, "especially in low visibility conditions such as rain or darkness" should be driving no faster than a speed at which they can stop in the distance they can see to be clear. Again, education and enforcement is more likely to improve road safety than hi-vis gear which clearly makes no difference to the safety of the wearer.